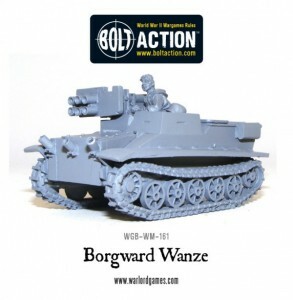 Warlord Games keeps rollin' out the new vehicles for Bolt Action. Their latest is the Borgward Wanze. As the sun set on Hitler’s Third Reich, the desperate German defenders converted Borgward IV demolitions vehicles into makeshift tank hunters. These small, tracked vehicles could pass where anti-tank guns and larger vehicles struggled to get through the rubble and battlefield debris in urban battles.